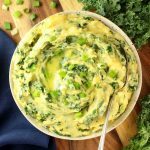 Cheesy Kale Mashed Potatoes - a fabulously nutritional veggie and a ridiculously delicious side dish all at once. Add salt and potatoes to a pot of cold water, then bring to a boil. Reduce to a simmer then cook for 18 minutes, or until fork-tender. Meanwhile, bring olive oil to medium heat in a large saucepan. Sauté kale for 3 minutes, then add garlic and green onions and cook for one more minute. When potatoes are cooked, drain them then rice them into the empty pot. Add warm milk, melted butter and cheddar cheese then stir. Fold in the cooked kale & veggies. To serve, top with remaining chopped onions and more melted butter if desired.